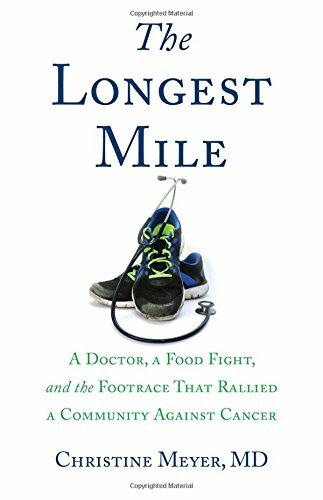 “The Longest Mile” by Christine Meyer, MD is an incredibly inspiring story about the power a person can generate with enough passion for a purpose. Dr. Meyer shares her journey to really make a difference in the lives of those struggling with cancer. She not only treats patients with the disease, but also turns her life upside down to make a long-term difference by fundraising and running for cancer cures. Dr. Christine Meyer is a devoted wife, mother, and doctor. She took up running with her husband’s encouragement when she felt heavy and depressed after the birth of her last child. Running has had a big impact on her life, and she was looking for a way to make a big impact on the cancer patients she served. The sense of hopelessness watching people suffer and die from cancer was difficult. She got the idea to enter the Broad Street Run in her local town, which was a charity run, and difficult to get into without a team of fundraisers. She went to work to build her team of runners, then set off on creating a fundraising “food fight” event to wow local family, friends and other guests. The food fight was a contest between Dr. Meyer and her good friend, Tom, a fellow foodie. They both spent weeks creating a five-course gourmet meal that would be presented to the public for judging. Normal life stopped for the good-natured doctor as she became fixated on preparing the perfect meal and winning the contest. The food fight was an overwhelming fundraising success. The team overcomes many obstacles along the way, and finds a way to stay united. I highly recommend “The Longest Mile” by Christine Meyer, MD to anyone looking for a pick-me-up. Readers affected by cancer in any way will find comfort in this book, knowing that there are so many caring people out there eager to help fight cancer. Dr. Meyer finds a way to keep a positive and humorous perspective on a dark subject. Well done!